Savannah, Georgia inns look forward to hosting you during your attendance of the 5th Annual Savannah Book Festival, one of many February Events in Savannah! This year, the Festival is a five-day event in honor of the Book Festivals fifth anniversary. It will be a fun, informative, and entertaining celebration of books and the written word. Authors from all over the country will be in attendance to present their work to, and discuss their work with, audiences in attendance. Held this year from February 15 through February 19, 2012, the Savannah Book Festival is a world-class literary event bringing over 40 critically-acclaimed authors and thousands of readers together in Savannah. This event is free and open to the public. However some specific events, presentations, and ceremonies are ticketed affairs. Tickets are first-come, first-serve and can be purchased online at SavannahBookFestival.org. Tickets are non-refundable, but are transferrable, and must be made by 5pm on Wednesday, February 8, 2012. You will also see a few fundraising activities during the event to keep this a free festival in the future. Most events take place in or around Telfair Square in historic downtown Savannah, GA, within one mile of most of our Romantic Inns of Savannah (Tybee Island notwithstanding). Presentation venues include the Telfair Museum, the Telfair’s Jepson Center for the Arts, and Trinity United Methodist Church. While there is not yet a specific itinerary for each day, we do know that you can come to the main Savannah Book Festival tent to purchase books and have them signed by authors. So far there are 42 authors who will be in attendance during the event. - Wednesday, Febrary 15, 2012: Kick-Off Celebration with An Evening with Brad Thor, Cocktails and Dinner at the Plantation Club in The Landings at 6PM. This is a ticketed event. - Thursday, February 16, 2012: An Evening with Walter Isaacson at the Trustees Theater at 6:30 PM. This is a ticketed event. - Friday, February 17, 2012: Evening Keynote Address with Pat Conroy at the Trinity United Methodist Church at 6 PM and VIP/Meet the Author Party to follow at the Jepson Center. This is a ticketed event. - Saturday, February 18, 2012 from 9:30 AM to 5 PM: Author Presentations in the Jepson Museums, Trinity United Methodist Church and tent in Telfair Square. - Saturday, February 18: Evening Authors Only Party to be held at a private home in historic downtown Savannah. This event is, regrettably, not open to the public. - Sunday, February 19, 2012: Closing Address with Guest of Honor, Stephen King at 3:00 at the Trustees Theater. This is a sold-out ticketed event. A full schedule of daily events will be available on February 1, 2012. So come stay at your favorite area bed and breakfast, and walk through historic downtown while attending the Savannah Book Festival! We realize that Christmas 2011 is not even upon us, but it is never too soon to plan a Savannah romantic getaway for those upcoming holidays. Last week, we covered some GREAT ideas for celebrating New Years Eve and New Years Day, 2012. And that weekend will be here before you know it. But, an even more important day is looming: one for romance, indulgence and celebration. Yes, February 14, 2012 is imminent. 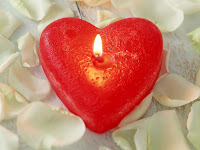 Have you decided how to pamper your sweetheart on this monumental day? May we suggest a bit of extravagance during a romantic bed and breakfast holiday? Whether you prefer to be deep within the Savannah Historic District, charmed in the Victorian District, right in the middle of the Shopping District, or finding escape on Tybee Island, Savannahs gorgeous inns will help you set the perfect stage for a superb romantic escape. Need something special during your weekend together? Our innkeepers are amazing hosts who are happy to help you find a perfect restaurant, a wonderful spa, or amazing settings for any picnics to be eaten, questions to be popped, or just some simple time together. Inquire soon about room availability and any specials each of our Romantic Inns of Savannah may have for the holiday, and enjoy some time away with us! The New Year is looming, why not treat yourself to New Years in Savannah? 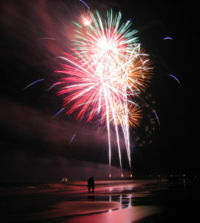 The annual Tybee Pier Fireworks are lit at midnight, but before that there are plenty of area events to help you say goodbye to 2011 and hello to 2012! Here are just a few events to choose from. The Westin New Year's Bash is a traditional celebration with activities for the entire family. Beginning at 10:00 am, this family-friendly celebration features foot races, live music by Big Daddy Weave and much more! City Market offers a free outdoor street party with live music all evening! This free outdoor street event happens all evening, and live music will be featured between 9:00 pm and 1:00 am. If you plan on dinner at one of the great restaurants in the Market, reservations are strongly encouraged. Savannah Riverboat Cruises offers events all evening on December 31, 2011. It all begins with a 2-hour dinner cruise complete with music and buffet at 7:00 pm. A 4-hour New Year's Eve Gala Dinner begins at 8:00 pm with a Captains reception, gourmet dinner buffet, a bottle of house champagne or wine, party favors, live bands, and cash bar. A New Year's Celebration Party complete with music and favors at 10:00 pm. Jazz’d Tapas is hosting a Studio 54-themed NYE bash, complete with 70's (and modern) hits, disco lights and decorations. Expect revelers to dress the part! If you want to guarantee a place at this party, $75 a person buys you their famous Tapas for Two, a champagne split, party favors, and your own private table for the entire evening, even if you leave the building! Yes, you can eat, hit the town, and then come back to your private table to enjoy the rest of the night! However, reservations are not necessary, as the bar is open to the public the entire evening. On New Year's Day, 2012 you can take part in the annual Tybee Polar Plunge! Benefitting the Tybee Post Theater, the official event begins at noon at the Tybee Pier. Find a group of 4 or more and sign up to take the plunge! However, you're welcome to simply watch the festivities, costumes, and fun. Who will win the coveted Le Goofs Trophy in 2012? You can also help us break a World Record whether or not you're swimming: The Guiness World Record™ attempt to break the Largest Gathering of People Wearing Swim Caps, will begin at 11:45 and must last at least 10 minutes (there is a $25 fee to participate). These are just the highlights, any of our great innkeepers will be glad to suggest additional New Year's Eve options during your visit! So make your reservations NOW at your favorite Savannah Inn for New Year's, 2011-2012! Your room, and the entire city, will be awaiting your arrival! The Romantic Inns of Savannah welcome you to enjoy a December getaway at any of their area inns. While here, enjoy the continuing December festivities with the 11th Annual Trees for Life holiday event at the Westin Savannah Resort. The Westin moves from gingerbread to Christmas Trees during this fundraiser for the Greenbriar Children's Center. Sponsored by the Savannah Harbor Foundation, this event features beautifully- and creatively-decorated Christmas trees on display in the hotel lobby. 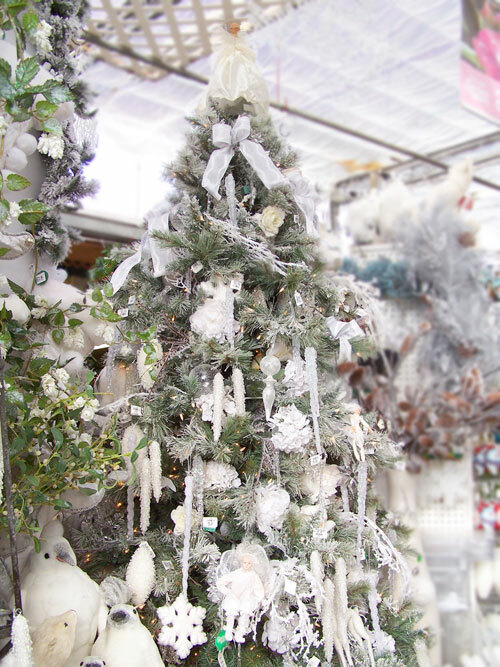 Local businesses, groups, and individuals provide the trees which will be auctioned off to the highest bidder! 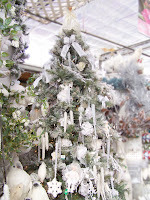 Holiday Trees for Life can be viewed alongside the annual Gingerbread Village through January 1, 2012. The Westin is just a ferry ride across the river from your favorite Savannah Bed and Breakfast, and we look forward to hosting your stay!